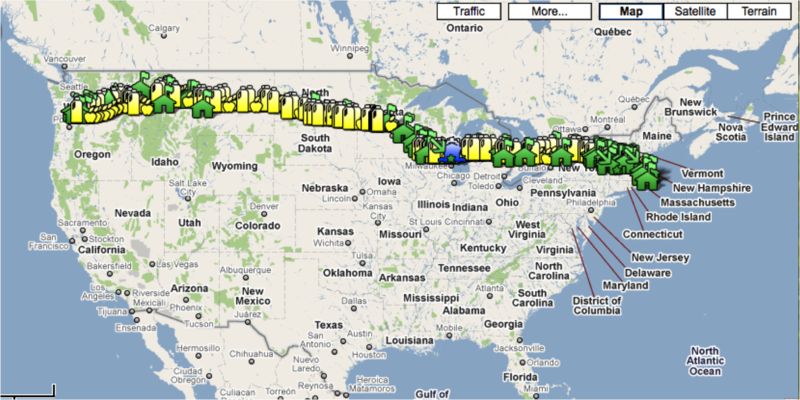 Check out the overall statistics for the week and have a look at the interactive maps of the route! Amy Nordrum – This sounds like a great adventure, so exciting to be able to actually feel America and meet people where they call home. Have fun, soak in the entire experience but be safe. I am sorry Bill and I will not be able to cheer you on as you arrive at the farm, Utah and Sturgis will be beckoning us at that time – off to “Bike” another state and create more memories! I will be watchng your progress. Will there be a publisher for your documentary at the end of the journey? WE WILL BE WATCHING YOUR PROGRESS AMY . AS YOU GO TO FARM RIDE HWY 14 THROUGH MADISON AND LEAVE THE DOCKS IN MILWAUKEE. Way to go all you guys!! It’s so fascinating to follow you and learn about the neat farms and people you encounter along the way. I grew up on a small farm so any farm has special meaning to me. All the best on your trip… and beyond. and they have a stronger base in Oregon.